Alphabetical index of all the third party booking sites - click on a website name to jump directly to their power ranking, my opinion, and things to watch out for. green text = actually a meta-search site, not a booking site. read: "the difference between a meta-search site and a booking site"
1) should I book directly with the airline, or through a third party booking site? 2) if I do book through a third party booking site, which is the best site to use? 3) Is [insert site here] ok to use? Can I trust them? All things being equal, I would usually prefer to book directly with the airline rather than through a third party booking site. And whenever possible, I try to steer people towards the airline's own website for booking, assuming the amazing price is available there. When you book through a third party site, the airline does not view you as their customer. They believe the third party is responsible for helping you out should you require to make any changes, and should you try to contact the airline for help they will always direct you back to the third party that made your booking. This can be annoying, as it's usually easier (and cheaper) to deal directly with the airline should something go awry or if changes need to be made. There are two common situations where booking directly with the airline is either less appealing, or not possible at all. The airline (and their website) are not showing the flight(s) or itinerary you want, but a third party booking site *is* showing them. This happens a lot, especially when it involves flights using multiple airlines. The price of a certain flight is cheaper through a third party booking site than it is directly through the airline (or their website). Yes, it does happen. With Situation #2, the question becomes: "How much cheaper does it need to be through the third party site to tempt you away from booking directly with the airline?" If there's a $5 difference, it's probably not worth booking through the third party. But what if it's $50 cheaper through the third party site ? Or $500 ? Everyone has a different threshold. And if you *are* tempted to book through a third party site, which one should you use? Who can you trust? If you try Googling for reviews on third party booking sites, you'll just end up more confused than ever, because *every* third party booking site (and seemingly every airline) has numerous negative reviews, due to the fact that whenever *anything* goes wrong with someone's vacation, the booking site inherently becomes the one people usually blame. Sometimes this blame is justified, but other times it's due to factors that really aren't in the control of the booking site in any way, but people inevitably need someone to vent their frustrations at (eg. airline unexpectedly re-schedules or cancels their flights, the hotel room wasn't clean, it rained all week, the margaritas weren't strong enough, etc, etc). I'm also pretty convinced that many people don't realize how much it can cost to make any changes to a booked airfare, *regardless* of whether you booked through the airline directly or through a third party site (who will pass those charges from the airline along to you, and usually tack on a $50 service fee of their own). This leads to numerous angry reviews from people who think the third party booking site is trying to extort them for 'hundreds of dollars to change my flight' - when in reality, the bulk of that charge is coming from the airline, who would have charged them the same amount, minus the typical $50 service fee. The reality is, some of these third party booking sites are absolutely enormous on a world wide scale, in terms of the number of bookings they process each day. Some of them process millions of bookings a year. If even 1/10th of 1% of those bookings result in an unsatisfied customer, that can potentially mean thousands of negative reviews that end up on the Internet. What this all means is that you probably have over a 99% chance of things turning out absolutely fine when booking with any decent, well known third party site, but you sure wouldn't know it by reading about the 1% of bookings that turn into negative reviews. People do *not* review third party booking sites on the 99% of occasions when everything goes well. However, having witnessed thousands of conversations and opinions from Canadians about the various third party booking sites over the years, I do see certain things being mentioned time and time again about certain sites, and the experiences travelers have with using them. I also have my own opinions about the quality of the various third party sites, based on using them myself, since the dawn of the online travel age, and keeping close tabs on the online travel industry in general over the years. With all of these opinions taken into account, I've decided to rank the third party sites in order of preference, as well as point out specific things to watch out for when making a booking using certain sites. Make sure you know what currency the site is displaying their prices in. Some are better than others at making it clear. Always assume it's U.S. dollars ($USD) until you see it explicitly mentioned otherwise. Sometimes there is a way to change the site to display in Canadian ($CAD) - but other times there is not. Every day, I see comments from Canadians that think they've found an amazing discount on an airfare, only to discover that the price they're looking at is actually in U.S. dollars, not in Canadian. This can make over a 30% difference in the price when comparison shopping between sites. Sometimes the prices are even in Euros or Pounds! I can only imagine how many people book these fares in a currency other than $CAD, not realizing it until they see their credit card statement. By this point, it's too late. As a Canadian, it's possible to book a flight even if the site is only willing to display prices in $USD. Just keep in mind you'll automatically be charged in $CAD by your credit card company, using today's exchange rate, plus approximately another 3% in currency conversion costs. On occasion, it can actually even be cheaper to book a flight that is priced in $USD (and then charged to your credit card in $CAD, with a 3% surcharge), versus booking directly in $CAD. This is somewhat rare though. This is the fee that the third party booking site will charge you, should you request to make any changes to (or cancel) your flight down the road. This service fee is above and beyond the two other charges that the airline would *also* charge you, had you booked directly through them instead. In my research for the power rankings, I found that the typical third party service fee averages around $50 CAD. 3. Know what site you're on! It sounds obvious, but some of the common third party booking sites have very similar sounding names, and every day I see people that get the names mixed up. You don't want to mix them up, as they all have different policies and service charges, or they could be displaying prices in different currencies, etc. Some of my favorite sites you may have seen me bring up time and time again over the years, such as Google Flights or Kayak are not third party booking sites. They are what are known as meta-search sites, which means they search multiple third party booking sites, and then send you to one of them, and that third party site is in control of your booking. I often see people mistakenly claim "I booked my flight with Kayak / Google Flights / Skyscanner / Momondo, etc." In reality, the person was sent *from* the meta-search site to a third party site for the actual booking. That third party site is where the booking was generated, and the quality of the third party site you end up at is all that *really* matters, not the meta-search site that sent you there. The meta-search site involved really has no control whatsoever over your booking. Below you'll find a ranking of all the third party booking sites you're ever likely to run across online, including all the booking sites that the popular meta-search sites will send you to. I would strive to book with sites ranked #1 through #20 whenever possible. For the record, over the last 6 years, I have yet to see a deal where it was necessary to send anyone to a third party site ranked lower than #20 for booking. Yes, Expedia. You've probably heard of it! If you ever need support it's likely going to be someone based in Egypt (virtually all third party sites use offshore support), but they have excellent booking technology, and tickets are issued from the airline quickly, at the verified price that is shown on their website. This is important because there are some third party sites with poor booking technology where this is not the case. They'll accept your payment details, and *hope* they can book your ticket at the price that was shown to you. If they can't, you'll receive a follow-up phone call or e-mail asking if you would still like the ticket (but at a different price). If you don't agree to the new (and likely higher) price, you will not be charged. These are legitimate booking sites, and they're not *trying* to pull a bait-and-switch on the public. They just don't have the higher quality price verification and booking technology in place that other sites like Expedia do. Typically, the larger the site, the better the technology behind it. I'll point out the third party sites that have poor booking technology as we make our way down the power rankings. It's very easy to find numerous negative reviews of Expedia where someone found something to complain about, but also keep in mind they process over 40 BILLION dollars worth of bookings per year. Doing the math, if even 0.1% of their 20 million annual bookings resulted in a bad review, that would be 20,000 bad reviews! The airline's change fee + the increase in airfare price. So, the same as what the airline would charge you if booked directly. Expedia.com allows free 24 hour cancellation, with 24 hours counting towards business days only. This is NOT the case with Expedia.ca - where free 24 hour cancellation really means the next 24 hours, whether it's business days or the weekend. Expedia.com is in U.S. Dollars ($USD). The only site that processes more bookings per year than Expedia these days is Priceline. They've had some great deals over the years, and have even honored all of the obvious 'error fares' that I can recall, including a round-the-world mistake fare for $130 ! The booking technology at Priceline is solid, and tickets are issued quickly. $35 USD Priceline service fee + the airline's change fee + the increase in airfare price. So, changes are $35 USD more than what the airline would charge you if booked directly. Priceline allows you to cancel your airfare booking for free, within 24 hours of booking, as long as you call before 11:30 PM EST. Priceline issues full refunds, with no hidden fees, which is very rare. Flights involving Air India, JetBlue, or Spirit Airlines cannot be cancelled for free. Priceline always defaults to displaying prices in $USD, until you explicitly change it to $CAD (near the top right, on the search results page). Be aware that this setting could change back to $USD when you close your browser. CheapOair has one of the more positive reputations amongst Canadians. Occasionally I've seen them display supposedly 'verified' prices they couldn't deliver on. Their booking technology is not quite as solid as say, Expedia, Priceline or Orbitz. But on the other hand, I've always heard generally good things about their customer service. And their service fee, should you require to make any changes, is quite low by industry standards, at $26 CAD (assuming it's not a multi-stop or business class / first class flight, as explained below). $26 CAD CheapOair service fee + airline change fee + the increase in airfare price. So, changes are $26 CAD more than what it would cost if booked with the airline directly. Note that the service fee can be higher ($50-$100 CAD) if it's a multi-stop flight, or a business class / first class flight, as shown on their terms & conditions page. CheapoAir allows you to cancel for free if it's within 4 hours of booking, or before midnight of the same day, whichever occurs first. If it's 4 hours after the time of booking but still before midnight of the same day, changes can be made for $25 CAD per ticket. www.cheapoair.com will display prices in $USD. Orbitz and CheapTickets are the exact same site. They are (were?) one of the big players in the third party booking site world, but are now owned by Expedia. Similar to Expedia and Priceline, Orbitz has solid booking technology. Tickets are issued quickly, and if a price is verified on Orbitz, it's extremely likely they'll be able to deliver on it. Their 'best price guarantee' for airfares is notoriously difficult to make a claim on. Should you require to make any changes to your booking, the Orbitz service fee, at $38 CAD, is lower than the industry average of $50 CAD. $30 USD Orbitz service fee + airline change fee + the increase in airfare price. So, changes are $30 USD more than what it would cost if booked with the airline directly. You can cancel your flight within one day of booking, up until 11 PM EST. However, while the cost of your flight is fully refunded, Orbitz charges a $30 USD 'service fee'. Orbitz and CheapTickets prices are *always* in $USD. Neither site offers the option to display prices in $CAD. Do *not* get CheapTickets.com confused with CheapTickets.ca (a site which has no affiliation with CheapTickets or Orbitz whatsoever and should be avoided). For all intents and purposes, Travelocity is really just Expedia now. Yes, another giant online booking site that was swallowed up by the big E.
Travelocity has solid booking technology. They have had a few public incidents in the past where they didn't honor a promo code that was exploited. On the other hand, they've had a few well known incidents where they *did*. $40 USD Travelocity service fee + airline change fee + the increase in airfare price. So, changes are $40 USD more than what it would cost if booked with the airline directly. With Travelocity, you can cancel your flight for free within 24 hours of booking. Travelocity.com displays prices in $USD. FlightNetwork and FlyFar are really the same site, although FlightNetwork is marketed much more heavily and way more common to run across. FlightNetwork has a good reputation overall. Their well advertised 'price drop protection' is really in the form of a credit which can be applied towards a future flight, and not cash back, but that's still pretty generous considering there's really only about $10 worth of profit to be made on the sale of most flights. There are a few sites that claim to offer price drop protection, but from what I've seen, FlightNetwork is seemingly the only one that does not work hard to screw customers out of a price drop claim with an endless list of technicalities. $100 CAD FlightNetwork service fee + airline change fee + the increase in airfare price. So, changes are $100 CAD more than what it would cost if booked with the airline directly. This is a pretty steep service fee relative to the industry average of $50 CAD. Take the high service fees into consideration if you think there's a good chance you'll want to change your flight after booking. It does not appear that Flight Network has any sort of 24 hour cancellation policy. It's best to assume you cannot cancel your flight within 24 hours of booking without paying a hefty fee. Prices on FlightNetwork and FlyFar are in $CAD by default, and they are in fact, Canadian owned companies. FlightNetwork often has a promo code out for another $10-$20 off the price of a flight. It can be difficult to find the spot to enter this promo code. You'll find the spot to enter the promo code on the passenger details page (after you've selected the flight). Being an Australian company, it's not overly common to run across WebJet here in North America but they do have a decent reputation, and have come through on a few great deals in recent memory. $25 to $100 CAD WebJet service fee (depending on domestic vs international flight) + airline change fee + the increase in airfare price. So, changes are $25-$100 CAD more than what they would cost if booked with the airline directly. If you pay $13.99 for the WebJet 'Best Purchase Guarantee' when you book your flight, your flights are fully refundable for the next 12 hours. However, while the cost of your flight is fully refunded, WebJet keeps the $13.99. Full details can be found here. www.webjet.com are displayed in $USD. I have mixed emotions about FlightHub. On one hand, their customer service has quite a bad reputation, and they have expensive change fees. But there's no doubt about it, there have been numerous occasions where they are one of the few (or only) sites showing an amazing (and bookable) price. If it were not for that saving grace, I would be tempted to rank them lower. The consensus on FlightHub seems to be: If you don't anticipate needing to change or cancel your airfare down the road, they are fine to book with. JustFly is run by the same company behind FlightHub, so my advice would be similar for both. FlightHub is marketed *much* more heavily on the web, and it's fairly rare to run across JustFly. $75 to $150 CAD FlightHub or JustFly service fee (depending on domestic vs international flight) + airline change fee + the increase in airfare price. So, changes are $75-$150 CAD more than what they would cost if booked with the airline directly. These are quite high service fees, which you should take notice of, if you think there's a strong chance of you needing to change your flights later. Triple-check all of your details before booking through FlightHub or JustFly, to make sure no changes will be required. If you pay $19.99 for the FlightHub 'Best Purchase Guarantee' when you book your flight, your flights are fully refundable within the same day of purchase (until 11:59 PM EST). The prices on FlightHub or JustFly are generally in $CAD by default, especially if you've arrived there from a meta-search site, such as Kayak or Skyscanner. On FlightHub, it's possible to change the displayed currency in the top right of your screen, under the phone number. Look in this area to double check that the prices are being displayed in $CAD. (On JustFly, click on the name of the country, to the left of the phone number). FlightHub and JustFly both try to add the extra $20 'Best Purchase Guarantee' (see above) to your bill by default during the flight booking process. You can easily deselect it, it's right above where you enter your payment info. You may have run across FareBoom when using Momondo, the meta-search site. I find they are quite good at offering the lowest prices available, and I like the fact that their site offers some innovative search features, beyond the typical cookie-cutter template. The FareBoom Flex Search allows you to search large date ranges at once, with very flexible durations (up to 5 days on either side). Their Flight Map (displaying the cheapest prices around the world) is well designed. I can't speak to their customer service, as I have not seen many Canadians mention FareBoom. FareBoom does not list the service fees involved with changing flights on their website. It does not appear that FareBoom has any sort of 24 hour cancellation policy. It's best to assume you cannot cancel your flight within 24 hours of booking without paying a hefty fee. FareBoom seems to be able to detect that you are visiting the site from Canada, and sets the currency in the search results to display in $CAD. But you can make sure of this by checking near the top of the website, towards the middle. FlightCentre is Australian owned, but pretty big in the Canadian market, and I can't say I've heard too many bad things about their customer service. The FlightCentre terms & conditions page does not give a clear indication of how much their service fee actually is. It does not appear that FlightCentre has any sort of 24 hour cancellation policy. It's best to assume you cannot cancel your flight within 24 hours of booking without paying a hefty fee. The prices displayed on FlightCentre.ca are always in $CAD. I can't say I've ever really seen a flight price that was exclusive to RedTag. They're more known for helping people with booking all inclusive packages, but they're pretty big as far as Canadian travel sites go, and I've always heard good things about their customer service. The RedTag terms & conditions page states that service fees will apply (in addition to the airline change fee + the increase in airfare price, as usual) - but they don't stipulate what that service fee actually is. It does not appear that Red Tag has any sort of 24 hour cancellation policy. It's best to assume you cannot cancel your flight within 24 hours of booking without paying a hefty fee. The prices on RedTag.ca are always in $CAD. RedTag also adds an additional $15 ticketing fee (per ticket) upfront to the total cost of the airfare. ITravel2000 one of the larger, well-known, Canadian-owned booking sites out there. If you've ever listened to Canadian radio you've probably had their catchy jingle stuck in your head at some point. I've heard their support is generally quite good, and actually based in Canada as well. 2017 update: ITravel2000 is now owned by RedTag. Consolidation in the Canadian travel industry. ITravel2000 does not list the service fees involved with changing flights on their website. This seems to be a common theme with Canadian based booking sites. It does not appear that ITravel2000 has any sort of 24 hour cancellation policy. It's best to assume you cannot cancel your flight within 24 hours of booking without paying a hefty fee. On ITravel2000 the prices are always in $CAD. It's the only currency they display. Nanak Flights is a small-time agency based in Brampton, Ontario. I see them mentioned once in a blue moon (usually by Skyscanner users wondering if anyone else has used them). This is pure speculation, but my guess is that their booking technology is slow, clunky, and fraught with issues, similar to other small-time agencies. You'll probably have to fax in your credit card details at some point. The majority of their positive reviews on Google seem to be written by family members. 2017 update: I've seen a fair number of Canadians mention that they have had good booking experiences with Nanak Flights, and I've bumped up their ranking. They seem to be one of the better, smaller agencies out there, and quite often I see them displaying the lowest price on an already great deal. I can't seem to find their service fees listed anywhere. The terms & conditions page simply states that they 'reserve the right to charge a fee for services'. It does not appear that Nanak Flights has any sort of 24 hour cancellation policy. It's best to assume you cannot cancel your flight within 24 hours of booking without paying a hefty fee. On Nanak Flights, the listed prices are always in $CAD. SellOffVacations is a well known Canadian travel search site, that is actually owned by the tour operator Sunwing. Due to their marketing/branding, I find that people often associate SellOffVacations as being a source of 'last minute package deals and sell-offs', but in reality, the prices will be the same as on all of the other Canadian owned websites (RedTag, FlightCentre, ITravel2000, etc), as they all retrieve their prices from identical suppliers. SellOffVacations does not list the service fees involved with changing flights on their website. This seems to be a common theme with Canadian based booking sites. It does not appear that SellOffVacations has any sort of 24 hour cancellation policy. It's best to assume you cannot cancel your flight within 24 hours of booking without paying a hefty fee. On SellOffVacations the prices are always in $CAD. It's the only currency they display. It hasn't been too often that I've seen any prices that are special or unique to OneTravel, but any feedback I've heard about their customer service is usually pretty decent. OneTravel is owned by FarePortal Inc, the same company that owns CheapOair. $35 USD OneTravel service fee + airline change fee + the increase in airfare price. So, changes are $35 USD more than what they would cost if booked with the airline directly. OneTravel offers free cancellation for the first 4 hours after booking. After the 4 hour point, they charge $50 for the cancellation, up to the 24 hour point. while prices on www.onetravel.com are in $USD. Kiwi (formerly Skypicker) is a booking site startup based in the Czech Republic. They have a pretty great map-based interface, and are doing some interesting things with airfares, such as merging airfares on the major airlines with airfares on budget airlines, and allowing you to book both at once. This can give you booking options that aren't available on other search engines. They do often show fares that can't really be booked though (the price changes once you get to the verification page). Kiwi does not list the service fees involved with changing flights on their website. It does not appear that Kiwi has any sort of 24 hour cancellation policy. It's best to assume you cannot cancel your flight within 24 hours of booking without paying a hefty fee. On Kiwi you can set the currency in the top right of your screen. Make sure it is set to $CAD. Hotwire is now just another site owned by travel behemoth Expedia. You'll notice their search result pages are identical in design. Hotwire is known for being a site where you might be able to get a great deal on a 'mystery hotel' (where you don't know what the hotel is until you purchase it). This concept has never really worked well for flights. I have yet to ever see any great mystery flight deals. Hotwire claims to only charge the 'airline change fee' ($150 USD to $300 USD) + the difference in airfare. So, theoretically, changes should cost the same as if you had booked directly with the airline, similar to Expedia. It does not appear that Hotwire has any sort of 24 hour cancellation policy when it comes to airfares. I would *think* they might allow it, as Expedia does, but it's best to assume you cannot cancel your flight within 24 hours of booking without paying a hefty fee. Watch out! I've noticed that on Hotwire, even when it shows $CAD selected on the main page of the website, when you get to the flight search result page, the prices are always in $USD. If you see something on Hotwire you like, you can always just search for the same thing on Expedia.ca and it will display the same flight, but in $CAD. BudgetAir and Vayama are really the same site, both owned by Travix International, a large agency in the Netherlands. Their reputation is kind of middle of the road, not terrible, not great. I probably wouldn't be afraid to book with them if they were the only one showing a great price. In regards to their booking technology, there have been a few incidents where they were unable to honor a displayed price (tickets weren't issued fast enough). BudgetAir or Vayama service fee of $100 $USD + airline change fee + the increase in airfare price. So, changes are $100 USD more than what they would cost if booked with the airline directly. This is a fairly steep service fee relative to the industry average of $50, so you may want to think twice if there's a good chance you'll want to change your flight plans later. BudgetAir lets you cancel your flight for free within 24 hours of booking BUT if the airline tickets your reservation within that time-frame, they will charge a $50 service fee. There's a good chance that BudgetAir or Vayama are showing you prices in $USD, but it really depends on how you arrived at the site. On BudgetAir, on the initial search results page it should show a '$C' beside the price (eg: $C 1043.56) - which is the price in $CAD. The same goes for the booking page. If it does not, you may want to try starting from www.budgetair.ca - which will redirect you to BudgetAir.com (but set the currency correctly). GoToGate is a booking site you might run across when using one of the large meta-search sites, such as Momondo or Skyscanner. They are owned by a large European travel conglomerate named eTRAVELi. I don't see Canadians mention GoToGate very often, but on occasion I have seen them offer some of the best prices on a deal. $100 CAD GoToGate service fee + airline change fee + the increase in airfare price. It does not appear that GoToGate has any sort of 24 hour cancellation policy. It's best to assume you cannot cancel your flight within 24 hours of booking without paying a hefty fee. ca.gotogate.com is the Canadian version of the GoToGate website and displays prices in $CAD, while www.gotogate.com displays prices in $USD. The biggest problem I've seen with Airfare.com over the years is how slow they can be at issuing tickets. This has led to a problem that I see with many third party booking sites, the ability to deliver on the price that a person thinks they've booked. On the other hand, they have come through on a few more recent deals. The tickets were always issued just fine, it just seemed like Airfare.com was slow at updating customers with their booking details. $200 USD (domestic flights) to $350 USD (international flights) Airfare.com service fee + the increase in airfare price. Airfare.com is one of the third party sites that does not relay the typical 'airline change fee' that most third party sites (and airlines themselves) will charge you, but makes up for it by charging a very high service fee. They're basically including the maximum typical airline change fee in their service fee. So, how much more you would *really* end up paying for any changes with Airfare.com (vs booking directly with the airline) is dependent on how much the airline involved would have charged you for their change fee. The typical airline change fee is around $200 USD. If you're using an airline that would have charged you less than this amount when booking directly through them, then Airfare.com is effectively adding a hidden service fee. Airfare.com explicitly states in their terms & conditions that they do not offer free 24-hour cancellation of any sort. If you're booking with Airfare.com 'through' Kayak Canada, (identified by ca.kayak.com at the beginning of the link), the prices shown should be identified as being $CAD on the Kayak page you're looking at. If you arrived at Airfare.com on your own, it's a different story. It seems that IF the departure city you use in your search is a Canadian one, the resulting prices will be in $CAD. But if the departure city you use in your search is an American city, the resulting prices will be in $USD. Sky-tours is owned by a UK based company, and ultimately they are a part of the TUI Group, a large UK travel conglomerate. In one form or another, they've been around for a number of decades. I can't say I've seen too many Canadians ever mention Sky-tours. They do seem to at least reply to their TrustPilot reviews, which is more than I can say for most travel booking sites. Overall, it does appear they at least try to give decent customer service, which again, is more than I can say for most travel booking sites. 45 Euro Skytours service fee + airline change fee + the increase in airfare price. So, changes are $65 CAD more than what it would cost if booked with the airline directly. Note that Sky-tours fees are actually in Euros, so the fee will vary with the exchange rate. It does not appear that Sky-tours has a 24 hour cancellation policy. It's best to assume you cannot cancel your flight within 24 hours of booking without paying a hefty fee. If you go to http://www.sky-tours.com/ the prices will be in $USD. If you go to http://www.sky-tours.com/ca/ the prices will be in $CAD. You can see which currency is being displayed by looking at the top of the Sky-tours website. Travelgenio and Travel2be are really the same site, both owned by a large Spanish travel company. If you've run across either of these sites, you were probably sent there from the meta-search site Skyscanner. Ranked #22, this is where we start to get into the third party sites I'd probably avoid, if possible, as it's likely you can find the same price on a better third party site. Travelgenio has had a pretty iffy reputation in the past, and there's a pretty good chance the support may only speak Spanish should you ever need to call. 30 Euro Travelgenio or Travel2be service fee + airline change fee + the increase in airfare price. So, changes are 30 Euro more than what they would cost if booked with the airline directly. It does not appear that Travelgenio has any sort of 24 hour cancellation policy. It's best to assume you cannot cancel your flight within 24 hours of booking without paying a hefty fee. Make sure you are on the .ca version of Travelgenio (www.travelgenio.ca) or Travel2be (www.travel2be.ca), to ensure the prices are displayed in $CAD. Ebookers is a European based booking site, that actually has a pretty storied history, involving some of online travel's biggest players, including Orbitz. They are now essentially just another booking site that is owned by travel titan Expedia. If you look at the Ebookers website, you'll notice the striking similarity between the two. $40 CAD ebookers service fee + airline change fee + the increase in airfare price. So, changes are $40 CAD more than what it would cost if booked with the airline directly. Note that EBookers fees are actually in pounds, since they are focused on the European market, so the fee will vary with the exchange rate. It does not appear that Ebookers has a 24 hour cancellation policy. It's best to assume you cannot cancel your flight within 24 hours of booking without paying a hefty fee. Ebookers only displays prices in British pounds. There isn't a way to book in $CAD. eDreams is a pretty big player over in Europe (where they are based), but it's become slightly more common to see Canadians mention them, now that they sometimes show up in meta-search site giant Kayak's results. Their support doesn't have a great reputation, and I think a lot of people end up accidentally booking in Euros with eDreams - leading to confusion about the price charged to their credit card. $60 CAD eDreams service fee + airline change fee + the increase in airfare price. So, changes are $60 CAD more than what they would cost if booked with the airline directly. It does not appear that eDreams has any sort of 24 hour cancellation policy. It's best to assume you cannot cancel your flight within 24 hours of booking without paying a hefty fee. while the prices on www.edreams.com are in Euros. Travel Cuts is a Canadian travel agency, with about 50 actual bricks and mortar locations across Canada (in addition to their online website). They tend to focus on helping students book travel, with alleged discounts for full-time students. It's unlikely there would be any real significant discounts on airfares. Perhaps on products with higher profit margins, such as tour packages. In terms of the Travel Cuts online site, it's a pretty standard search experience, and maybe a little lacking in features. $100 CAD Travel Cuts service fee + airline change fee + the increase in airfare price. It does not appear that Travel Cuts has any sort of 24 hour cancellation policy. It's best to assume you cannot cancel your flight within 24 hours of booking without paying a hefty fee. Travel Cuts always displays prices in $CAD. It's the only currency the website displays. AirfareExperts is another one of those smaller, Canadian-owned, travel booking agencies that you sometimes run across when using a meta-search site like Skyscanner or Momondo. In general, these types of small-time agencies have poor/slow booking technology, and they may get back to you 2 days after you think you've booked something, and tell you they were unable to actually book the ticket at the price you thought you had booked it at. I try to avoid booking with these types of sites. $50 CAD AirfareExperts service fee + airline change fee + the increase in airfare price. So, changes are $50 CAD more than what it would cost if booked with the airline directly. It does not appear that AirfareExperts has a 24 hour cancellation policy. It's best to assume you cannot cancel your flight within 24 hours of booking without paying a hefty fee. On AirfareExperts if you search for a flight that departs from the U.S. the prices shown will be in $USD (careful!). But if you search for a flight that departs from Canada, the prices shown will be in $CAD. You can make sure, by noticing the CAD that appears after each price (or the Canadian flag). Tripsta is another site you probably ran across while using Skyscanner. To be honest, I don't know a whole lot about Tripsta, and I rarely see anyone mention them. Their support number is a 1-900 number, and it appears to cost $0.99/min. If you've ever had to deal with anything travel related by phone, you know this could end up costing a small fortune! I would avoid using this booking site, if possible. $50 CAD Tripsta service fee + airline change fee + the increase in airfare price. So, changes are $50 CAD more than what they would cost if booked with the airline directly. It does not appear that Tripsta has any sort of 24 hour cancellation policy. It's best to assume you cannot cancel your flight within 24 hours of booking without paying a hefty fee. The prices displayed on www.tripsta.ca are in $CAD (even though they don't point this out anywhere on the site), while the prices on www.tripsta.com are in $USD. GalaTravels is yet another one of those smaller, Canadian-owned, travel booking agencies that you sometimes run across when using a meta-search site like Skyscanner or Momondo. I do think GalaTravels may at least try to offer decent customer service though, based on what I've read about them. They are essentially a family owned agency that has been around for over 35 years. GalaTravels does not list the price of their service fees on their website. It's best to assume that GalaTravels service fees are high. It does not appear that GalaTravels has a 24 hour cancellation policy. It's best to assume you cannot cancel your flight within 24 hours of booking without paying a hefty fee. GalaTravels prices are shown in $CAD by default. It's the only currency they display. We are really getting into the dredges of third party booking sites now. BuyMyTrip is yet *another* small-time booking site. BuyMyTrip is really 'SkyRoute Travel Services' based in Toronto. If you Google around for the reviews, you'll discover that it appears to essentially be a 1 man operation. Similar to other small-time agencies, I'd avoid them if possible, as the booking technology is likely slow, clunky, and fraught with issues, and it's likely you can do better. $60 CAD BuyMyTrip service fee + the airline change fee + the increase in airfare price. So, any changes would be $60 CAD more than if you had booked with the airline directly. It does not appear that BuyMyTrip has any sort of 24 hour cancellation policy. It's best to assume you cannot cancel your flight within 24 hours of booking without paying a hefty fee. On BuyMyTrip (both the .ca and the .com version), the displayed prices should always default to $CAD when you arrive, but you can make sure by looking at the top right of the page, beside 'Currency'. FareGeek is another small-time agency that you'll probably only run across if you use Skyscanner or Momondo. Similar to other small-time agencies, I'd avoid them if possible, as the booking technology is likely slow, clunky, and fraught with issues. $200 USD (domestic flights) to $350 USD (international flights) FareGeek service fee + the increase in airfare price. FareGeek is one of the third party sites that does not relay the typical 'airline change fee' that most third party sites (and airlines themselves) will charge you, but makes up for it by charging a very high service fee. They're basically including the maximum typical airline change fee in their service fee. 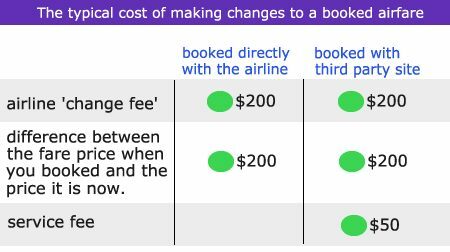 So, how much more you would *really* end up paying for any changes with FareGeek (vs booking directly with the airline) depends on how much the airline involved would have charged you for a change fee. The typical airline change fee is around $200. If you're using an airline that would have charged you less than this amount when booking directly through them, then FareGeek is effectively adding a hidden service fee. It does not appear that Fare Geek has any sort of 24 hour cancellation policy. It's best to assume you cannot cancel your flight within 24 hours of booking without paying a hefty fee. On FareGeek, IF the departure city you use in your search is a Canadian one, the results will be in $CAD. But if the departure city is an American city, the results will be in $USD. Yep, you guessed it, FareDepot is yet *another* small-time booking site that you'll probably only run across if you use Skyscanner or or Momondo. FareDepot is based in the United States. I'm fairly certain that FareDepot is run by the same company behind FareGeek. The sites do not have an overly similar appearance, but their terms & condition pages are identical. So it's either that, or one is plagiarizing the other. $50 USD FareDepot service fee + the airline change fee + the increase in airfare price. So, any changes would be $50 USD more than if you had booked with the airline directly. It does not appear that Fare Depot has any sort of 24 hour cancellation policy. It's best to assume you cannot cancel your flight within 24 hours of booking without paying a hefty fee. On FareDepot, the displayed prices are *always* in $USD. BravoFly is owned by a somewhat large European travel conglomerate based in Italy. Their support phone number costs $1.49/CAD per minute. This alone is generally enough of a red flag to avoid a booking site. BravoFly charges a 20 Euro service fee + the airline change fee + the increase in airfare price. So, any changes would be 20 Euros more than if you had booked with the airline directly. It does not appear that Bravo Fly has any sort of 24 hour cancellation policy. It's best to assume you cannot cancel your flight within 24 hours of booking without paying a hefty fee. BravoFly doesn't make it very easy to see what currency they're billing you in. While testing the site, there were times where I had allegedly set the currency to $CAD (top-right of your screen, beside the headphones), but it showed me the same price as when setting the currency to $USD. This makes me pretty nervous about their ability to even bill in the correct currency, and another reason to avoid them. TripAir is yet *another* small-time booking site that you'll probably only run across if you use Skyscanner or Momondo. TripAir is based in Greece. Their phone support is a UK number. 30 Euro TripAir service fee + the airline change fee + the increase in airfare price. So, changes would be 30 Euro more than if you had booked with the airline directly. It does not appear that TripAir has any sort of 24 hour cancellation policy. It's best to assume you cannot cancel your flight within 24 hours of booking without paying a hefty fee. On TripAir, the prices seem to be in $CAD. It seems to perhaps auto-detect your location and set the currency for you. Make sure it says 'C$' beside the price. AirTickets is yet *another* small-time booking site that you'll probably only run across if you use the meta-search sites Skyscanner or Momondo. AirTickets is based in Greece. Their phone support is a UK number. 30 Euro AirTickets service fee + the airline change fee + the increase in airfare price. So, any changes would be 30 Euro more than if you had booked with the airline directly. It does not appear that AirTickets has any sort of 24 hour cancellation policy. It's best to assume you cannot cancel your flight within 24 hours of booking without paying a hefty fee. On AirTickets, the displayed prices are in Euros by default. There doesn't appear to be a way to manually set the currency, but if you start your search at ca.airtickets.com the prices will display in $CAD. ExploreTrip.com is an American owned site. I don't think I've ever seen *anyone* mention them before, and I really can't dig up much info on their background. I would avoid them. 2017 update: There have been a few recent deals (notably to Japan) where ExploreTrip was the only one showing a really low price. Many, many Canadians booked these without problem and the tickets were issued from the airline. They still wouldn't be my first choice, but sometimes there isn't another one. I can't seem to find their fees listed anywhere. It does not appear that ExploreTrip has any sort of 24 hour cancellation policy. It's best to assume you cannot cancel your flight within 24 hours of booking without paying a hefty fee. On ExploreTrip, IF the departure city you use in your search is a Canadian one, the resulting prices will be in $CAD. But if the departure city is an American city, the resulting prices will be in $USD. BookAirfare is a third party site you might run across if you use the meta-search site Momondo. BookAirfare is based in the U.S.
Their fees are not mentioned anywhere on the site. In their terms & conditions, BookAirfare claims that if you purchase their $15 'Best Price Guarantee' at the time of booking, you can cancel your fare 'within the same day of the reseravtion' and receive everything back except for the $15. *However*, the terms also specify that the flight price needs to have dropped (within the same day of booking) to receive the refund, which makes it kind of useless. On BookAirfare, IF the departure city you use in your search is a Canadian city, the results will be in $CAD. But if the departure city is an American city, the results will be in $USD. Travelpack is one of those smaller, Canadian-owned, travel booking agencies that you sometimes run across when using a meta-search site like Skyscanner or Momondo. Travelpack does not list the price of their service fees on their website. It's best to assume that Travelpack service fees are high. It does not appear that Travelpack has a 24 hour cancellation policy. It's best to assume you cannot cancel your flight within 24 hours of booking without paying a hefty fee. Travelpack prices are shown in $CAD by default. It's the only currency they display. Hop2 is yet *another* small-time booking site that you'll probably only run across if you use Skyscanner. Hop2 is based in New York City. $100 USD (domestic flights) to $300 USD (international flights) Hop2 service fee + the airline change fee + the increase in airfare price. So, changes would be $100-$300 USD more than if you had booked with the airline directly. Very high service fees! The terms & conditions for Hop2 claims that 'in certain cases' (when the airline will allow it) it's possible to receive a full refund within 24 hours of booking, but a $50 USD charge will apply. On Hop2, the prices are *always* in $USD. There is not an option to change the currency to $CAD. MyTrip is yet another small-time travel agency based in Greece, with a UK support number. 15 Euro MyTrip service fee + the airline change fee + the increase in airfare price. So, changes would be 15 Euros more than if you had booked with the airline directly. That's actually the cheapest service fee I've seen claimed by any third party booking site, but it still wouldn't be enough to entice me to book through them. It does not appear that MyTrip has any sort of 24 hour cancellation policy. It's best to assume you cannot cancel your flight within 24 hours of booking without paying a hefty fee. On MyTrip it generally defaults to displaying prices in Euros. The currency can be changed by clicking on the little flag near the top-middle of the screen. StudentUniverse is a U.S. based travel site that has been around for a long time, but was acquired by FlightCentre in 2015. They obviously target the student demographic, with promises of discounts for students and youths. I am unaware of any flight deals through Student Universe that are actually cheaper than anywhere else. Perhaps on higher profit margin products, such as tours, there might be a genuine discount for students. $100 USD Student Universe service fee + airline change fee + the increase in airfare price. So, changes are $100 USD more than what it would cost if booked with the airline directly. This is a very high service fee. You would want to be 100% certain that you will never want to modify or cancel your booking when booking with Student Universe. It does not appear that Student Universe has a 24 hour cancellation policy. It's best to assume you cannot cancel your flight within 24 hours of booking without paying a hefty fee. Student Universe prices are displayed in $USD by default. To change it to $CAD, try clicking on the dollar sign ($) in the top right corner. FlyLink is another one of those smaller, Canadian-owned (based out of Toronto), travel booking agencies that you sometimes run across when using a meta-search site like Skyscanner or Momondo. FlyLink does not list the price of their service fees on their website. It's best to assume that FlyLink service fees are high. It does not appear that FlyLink has a 24 hour cancellation policy. It's best to assume you cannot cancel your flight within 24 hours of booking without paying a hefty fee. On FlyLink, if you search for a flight where your departure city is in Canada, the prices will be in $CAD. But if you search for a flight where your departure city is in the United States, the prices will be in $USD. SmartFares is a pretty generic booking site, allegedly based out of the U.S.. You occasionally see them as one of the booking sites associated with meta-search engines like Skyscanner or Momondo. I don't see Canadians mention SmartFares very often, so I can't really comment on their customer service. They do have a really high rating over at TrustPilot but from scanning through the reviews, I get the feeling a click farm in India was used to generate thousands of these fake, poorly spelled, short, and oddly positive reviews. SmartFares is currently unrated with the BBB and shows 250 complaints were submitted over the last 3 years. My spidey sense is telling me that SmartFares is a booking site to avoid. $100 to $200 USD SmartFares service fee + airline change fee + the increase in airfare price. So, changes are $100 to $200 USD more than what it would cost if booked with the airline directly. This is a very high service fee. You would want to be 100% certain that you will never want to modify or cancel your booking when booking with SmartFares! It does not appear that SmartFares has any sort of 24 hour cancellation policy. It's best to assume you cannot cancel your flight within 24 hours of booking without paying a hefty fee. SmartFares prices are always in $USD. It's the only currency the website displays. Meta-Search sites and apps will search multiple third party booking sites for airfares, and then send you to one of them to make your booking. I often see people mistakenly claim "I booked my flight with Kayak / Google Flights / Skyscanner / Momondo / etc." The third party site is where the booking is actually made, and the quality of the third party site you end up at is all that *really* matters, not the meta-search site that sent you there. The third party site is 100% responsible for your booking. However, there are certain strengths and weakness to each of the meta-search sites when it comes to actually searching for a great airfare deal. Once you've found a great deal on a meta-search site, you may want to note the third party booking site they're sending you to, and check out their review in the Third Party Booking Site Power Rankings to see if they're any good. The greatest strength of Google Flights is their ability to show you every possible date combination at near instantaneous speed. No other site can come close to matching this, as other websites need to physically search outside sources for airfares a few dates at a time, while Google Flights literally owns all of the live airfare data (it only cost them $750 million! ), and can do things with it at speeds that only Google can. If you're flexible on dates and destinations, no site makes it easier to browse available airfares quickly and easily. Google Flights has a pretty limited number of third party booking site partners they can send you to. Usually it's to Flight Network or Expedia, and sometimes directly to the airline. So when it comes time to actually booking the flight, it can sometimes be a challenge. Sometimes you'll click your way through to the booking site and find the price doesn't really exist. It's also quite common for Google Flights to show you what seems to be a great price, but be unable to give you an option for actually booking it. It will usually tell you to try calling an agent, or the airline. This can be futile if the price doesn't actually exist. They won't be able to book it either. Sometimes you might find the price exists on another meta-search or booking site. Other times, it's a price that can't really be booked anywhere, no matter where you look. Google Flights isn't trying to lie to you, it's just the nature of working with live airfare prices, which can be a complicated process. Kayak is a monster of a meta-search site. The Priceline Group bought them out for $1.8 billion a few years ago. I find Kayak is great for when you want to really dig deep into your search, and be able to sort and filter your flight options in a variety of ways. The other nice thing about Kayak is that *most* of their booking partners are of what I would consider to be high quality. You'll find that most of them rank highly in the Third Party Booking Site Power Rankings. There are other meta-search sites out there that will seemingly partner with just about any third party booking site out there, whether it's of high or low quality. Occasionally you will find a great airfare on Google Flights, only to discover it can't really be booked on there, and subsequently run the same search on Kayak, to find a booking site that can actually book it. About the only weakness I can think of for Kayak is that you can't easily browse all possible date combinations, like you can with Google Flights. Momondo is a meta-search site that simply does most things very well. The interface is easy to use, the results are fairly quick, and it has most of the standard sort & filter features one can expect. Momondo makes it easy to see your 'Cheapest', 'Quickest', and 'Best' flight options. The 'Best' option is comparing the price of the flight vs how long it takes you to get there, and showing you the flight that is the best balance between the two. There's a nice bar graph interface that allows you to quickly see if there are cheaper flights on alternate dates. Momondo is missing the ability to filter results by price. The third party booking sites that Momondo partners with have a wide range of quality, from the very best, to some that are more dubious. So be mindful of the third party site Momondo sends you to when making the booking, and check out their ranking in the Third Party Booking Site Power Rankings to see what the quality of the booking site is like and things to watch out for. Skyscanner has some interesting features, such as the ability to search fares from a city to an entire country (eg. Your City to Italy) and it will show you the cheapest prices to each airport in Italy. Or you can even search Country to Country (eg: France to Italy) and it will show you the cheapest prices between each country, a great way to figure out the cheapest cities to use when flying between the 2 countries. Their flexible date calendar is pretty powerful for browsing all possible date combinations, although it relies on recent Skyscanner searches, as opposed to Google Flights, who is using real, live prices. Skyscanner used to be known for being the best search tool to search all of the smaller, budget airlines that fly within Europe, although I'd say the other large meta-search sites have now caught up in this department. While Skyscanner does show you results from what I would say are the higher quality third-party booking sites, they do also seem to partner with a lot of the lower quality booking sites as well. So be mindful of the third party site Skyscanner sends you to when making the booking, and check out their ranking in the Third Party Booking Site Power Rankings to see what the quality of the booking site is like and things to watch out for. When Hipmunk first came on to the scene, they were known for the innovative way they displayed airfares, with a unique graphical layout of your flight options and stopover times. Personally, I was never really drawn to this layout, but visual learners might like it. They were also known for another unique feature (at the time), the ability to sort results by 'agony' which is comparing the price vs the duration of the flight, and giving you the flight option with the best balance between the two. Other meta-search sites now have a similar feature, such as Momondo's 'Best' flight option. Hipmunk seems to partner with high quality booking sites for the most part, and displays results directly from the airlines a bit more often than other meta-search sites. The flexible date search shows you a matrix grid of 7 days by 7 days, which is nice in theory, but it's limited in the sense that it only shows prices of recent searches made by Hipmunk users. For missing date combinations (and there can be plenty), you need to individually click on each one and run a search, defeating the purpose. Cheapflights has all of the pretty standard features found on a meta-search site, with the ability to filter by flight times, flight durations, number of stops, layover airports, and airlines. Similar to Momondo, Cheapflights offers an easy way to see your 'Cheapest', 'Quickest', and 'Smart Value' flight options, with Smart Value being the best balance between price and flight duration. Cheapflights is missing the ability to filter results by price. Most of the third party booking sites that Cheapflights partners with are of pretty good quality, but like a lot of meta-search sites, they do also partner with some of the lower quality booking sites as well. So be mindful of the third party site Cheapflights sends you to when making the booking, and check out their ranking in the Third Party Booking Site Power Rankings to see what the quality of the booking site is like and things to watch out for. Fly.com is actually owned by TravelZoo. It has all of the standard features found on a meta-search site, with the ability to filter by flight times, flight durations, number of stops, layover airports, and airlines. Fly.com also has the ability to filter by price, something not found on every site. The prices on Fly.com *may* appear in $USD until you set the currency in the top right corner. If you use the links from this page, the currency will be set to $CAD for you. Most of the third party booking sites that Fly.com partners with are of pretty good quality, but like a lot of meta-search sites, they do also partner with some of the lower quality booking sites as well. So be mindful of the third party site Fly.com sends you to when making the booking, and check out their ranking in the Third Party Booking Site Power Rankings to see what the quality of the booking site is like and things to watch out for. Tripadvisor is known mainly for hotel and attraction reviews, although they do have their own flight meta-search as well. It has all of the standard features found on a meta-search site, with the ability to filter by flight times, flight durations, number of stops, layover airports, and airlines. You can see flexible date results, if you click on 'Compare Dates' after you search, but it's pretty limited (1 day before and after). Similar to Momondo, Tripadvisor offers an easy way to see your 'Cheapest', 'Quickest', and 'Best Value' flight options, with Best Value being the best balance between price and flight duration. The third party booking sites that Tripadvisor sends you to for booking with seem to be of decent to high quality. Still, you should probably check out their ranking in the Third Party Booking Site Power Rankings to see what to watch out for. You can sort your results by price, but you can't filter your results by price. edmonton, yeg, articles and third party booking sites. No Responses to "Third Party Airfare Booking Sites: The Power Rankings - who to trust, who to avoid"